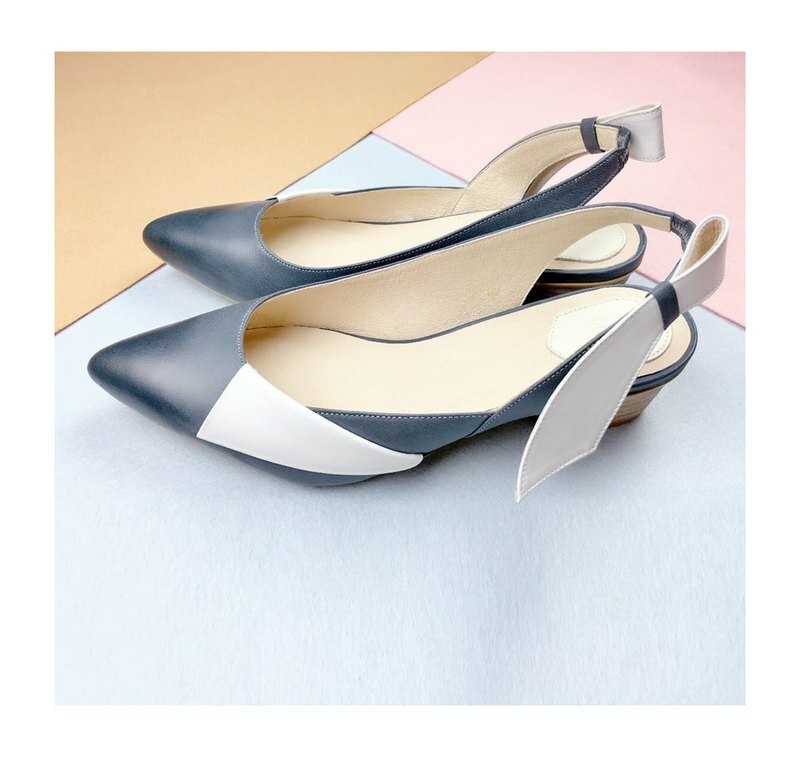 Leather shoes by handmade - Blue/White Pumps with bow. CLAVE [The Deep] Satyrichthys - Blue/White Taiwan is surrounded by the sea and endowed with natural resources and beautiful scenery. Yet in exploring the ocean, there are still some mysterious uncharted waters. In this season, CLAVE moves the scene into the deep sea but is not going to show you the coral reef, the tropical fish, the seashells or the romantic fantasies of the shallow ocean and the blue sea waves. The dark sea, more than 1,000 meters deep, cannot be reached by sunlight. It seems to be in motion alone with nothing to do with the time. The dark waters occupy 85% of the entire ocean and so far, we only know little about them. Because of the water pressure and the darkness, the harsh environment without human traces harbors a lot of deep sea creatures. Their bodies have evolved into peculiar structures and are self-luminous with grotesque and interesting appearances. CLAVE applies unbounded imagination in the fantasy journey, and with the unique design of the shoes, CLAVE will connect you with the mysterious world. /Product Specification/ This is specially ordered product and the manufacturing will start after payment is received. No order can be canceled when order is placed 3 days old. Delivery is 7-14days (excluded the transportation time). More than 2 additional weeks are needed when the leather stock is in shortage. Please pay attention for this specially made order you placed. No refund or exchange is allowed. Your support would be highly appreciated. Heel Height : 4 cm Size	EUR : 34 / 35 / 36 / 37 / 38 / 39 / 40 / 41 / Material / Blue/White leather Pointy-toe Square leather stack heel Leather lining / insole (Leather outsole NT.4280 USD.150 ) Heel Material : ABS / About Brand / One , two, three, four. One , two, three, four. People are swinging with their longings of naive. Following the musical notes, high-heel shoes are dancing. A distinctive rhythm is established with the beats. I heard your footsteps echoing as rhythmic as CLAVE. / About Designer / Art thrive the life and the life is in blossom by art. Held a great affection by how different the outlook could be with a petite accessory, keen for more spontaneous accessory design. / Use and Care / If the leather product is exposed to water, gently wipe the water off with a dry cloth and leave it in the shade to dry. Do not blow-dry or put the product in direct sunlight. If you are not using your leather product, put it back in its (a) dust bag, and store it in a cool and dry place. Every piece of leather has different grains, creases, and may even have scars or spots. This is a special feature of leather products. HAND MADE IN TAIWAN This product is handsewn. The actual sewing may be slightly different from the product photo. This cannot be counted as a defect.